Click on the image to download the schedule of events! Make time for these fun educational bird walks at the Trolley Trail and Vedder property with naturalist Chris Woerner. An evening of poetry with shoreline poets Carol Altieri, Juliana Harris, Nancy Meneely and Jen Payne. Bring your own poems for the open mic! At the Land Trust House, 26 School St, Stony Creek. 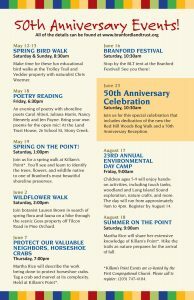 Join us for a spring walk at Killam’s Point*. You’ll see and learn to identify the trees, flowers, and wildlife native to one of Branford’s most beautiful shoreline preserves. Martha Rice will describe the work being done to protect horseshoe crabs. Tag a crab and marvel at its complexity. Held at Killam’s Point*. Stop by the BLT tent at the Branford Festival! See you there! Join us for this special celebration that includes dedication of the new the Red Hill Woods Bog Walk and a 50th Anniversary Reception. Children ages 5-9 will enjoy hands-on activities, including touch tanks, woodland and Long Island Sound exploration, nature crafts, and more. The day will run from approximately 9am to 4pm. Register by August 14. Martha Rice will share her extensive knowledge of Killam’s Point*. Hike the trails as nature prepares for the arrival of fall. *Killam’s Point Events are co-hosted by the First Congregational Church. Please call to register: (203) 747-4184.